George Zimmerman's defense team on Monday posted this photo online, which was taken by a police officer on the night of Feb. 26, 2012. The defense team for George Zimmerman on Monday posted a high-resolution color photo of the Florida neighborhood watch leader taken by police the night 17-year-old Trayvon Martin was fatally shot. The Feb. 26 photo, which was previously released as a black-and-white photocopy, was provided as a high-resolution digital file to the defense on Oct. 29. The shooting took place when Zimmerman encountered Martin, who was unarmed and walking through the Sanford, Fla., neighborhood where his father lives. Earlier this year, Zimmerman, now 29, pleaded not guilty to a charge of second-degree murder in the shooting death of Martin. In the highly publicized case, which has drawn national attention, Zimmerman maintains that Martin attacked and beat him. In July, he was released from Seminole County Jail after posting $1 million bond. Zimmerman remains out on bail and is in seclusion. Martin's family has called for a change in Florida's "Stand Your Ground" law, which allows the use of force in self-defense, when there is a reasonable belief of an unlawful threat. 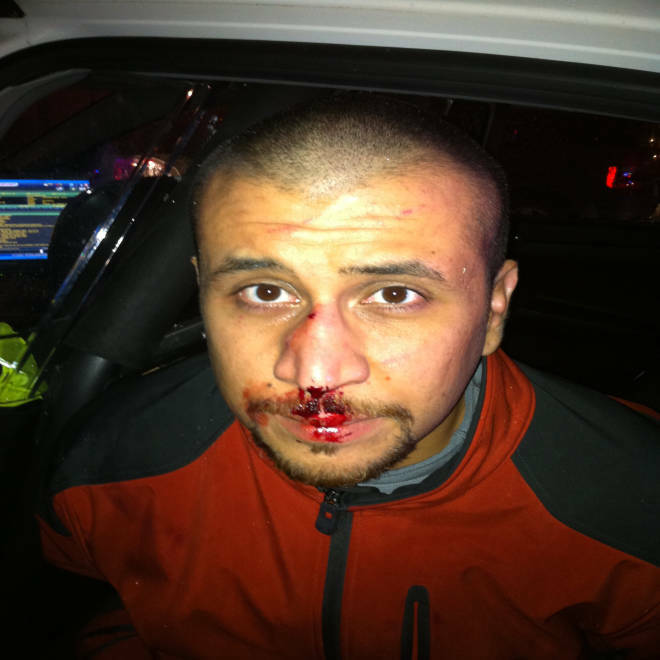 "This is a photo of George Zimmerman taken by a police officer on the night of February 26, 2012. A black and white photocopy of this image was provided by the State in the first Discovery. This high-resolution digital file was finally provided to the defense on October 29, 2012. This image was disclosed in the State's 9th Supplemental Discovery. In accordance with the updates to our media policy that we published on November 13, we will be making all public documents related to the case available on our website, including the rest of the State's 9th Supplemental Discovery as soon as we are sure it has been properly redacted according the the Court's stipulations on protecting information regarding specific witnesses." A spokesperson for the office of Special Prosecutor Angela Corey did not immediately respond to an email request for comment Monday. Benjamin Crump, an attorney for the Martin family, told NBC News the photo is not new evidence –- just a color version of a photograph that has already been seen.